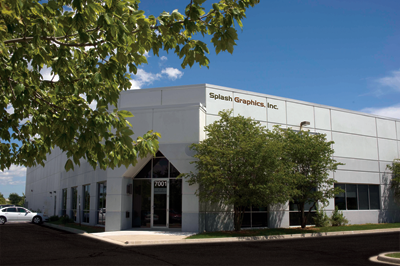 About Us : Brand Marketing, Flexography, Lithography, Photography, Prepress Services, Digital Asset Management, Wide format printing : Splash Graphics, Inc.Splash Graphics, Inc.
We believe we have something special here at Splash. We have a fantastic, nimble, and highly competent organization. It is easy to talk about ourselves as we believe we are unique in our environment. We are in a market space that is populated with competitors that have been ravaged with mergers and acquisitions. Today these competitors have morphed into large organizations which as a result of their size may be stogy and expensive. The term “diamond in the rough” was used by one of our clients after finding us. We are confident that you will have a positive experience with Splash Graphics. Our roots go back to 1992. We were known as Blooming Color back then. We really made a name for ourselves as one of the first premedia/prepress company to offer “Computer-to-Plate” services to the offset printing market. This new technology coupled with the knowledge to take a customer’s design and prepare it for the limitation of the printing process put Blooming Color on the map. In 1997, the business grew to a healthy commercial print operation with multi presses and extensive finishing operations along with our premedia services. Then in 2006, Blooming Color divested its print and bindery operation and re-established itself as Splash Graphics, Inc., Splash returned to its primary focus of premedia/prepress services. Today our present avatar Splash Graphics, Inc. is a rich, dynamic business that brings color to your world. The principal’s of both businesses have been the same Valji Patel, Bhavesh Vanani, and Dhiren Sanghani. Splash provides marketing support services that include content creation, photography, brand and color management, creative design, consumer packaging, IT services, Digital Asset Management (DAM) services, premedia services, flexographic and lithographic plates as well as customized solutions for specific marketing/workflow needs. Therefore, a company can interact with Splash for specific parts of a project or utilize our complete premedia solutions. Our customers will attest to the fact that we believe in the timeless traditions of hard work, honesty and perseverance. Valji Patel is the mild mannered, soft spoken business man who has a knack for understanding the market place and positioning Splash for the long term in a manner which brings solutions to our clients that are both timely and efficient. His mechanical engineering degree has proven to be a great asset and complements his natural logical way of thinking. Valji is an avid gardener, enjoys nature, loves the rain and has the patience of a farmer. He is actually a son of a farmer and he himself did farm for a few years in his early 20’s. A cotton farmer to boot! They say he grew his own clothes, amazing guy! Bhavesh Vanani on the other hand has absolutely no patience, (that’s probably because God didn’t have any left after he made Valji). If you walk by Bhavesh’s office you can usually hear him muttering to his computer to hurry up! We don’t think Bhavesh has ever farmed. He is the kind of guy that if he ever did plant a seed it would kill him, he couldn’t wait three months to reap the harvest. This personality has served our customers well over the years. As head of premedia production Bhavesh’s innate personality is a perfect fit for the quick deadlines and time sensitive nature of our client’s businesses. We get it! In this day and age everything happens fast and Bhavesh is the right man for the job. He sets the pace in our production team and as a result everyone here knows that time is of the essence. Bhavesh chased his Graphics arts education with a zeal that only comes with a real love for the field! Dhiren Sanghani another engineer in the group is focused on marketing and sales. Now you can only imagine what it must be like to work in between Mr. Patience and Mr. Impatience above. Dhiren has recently been showing signs of a split personality, but don’t worry we are monitoring him closely. He claims that Valji is toooo slow and Bhavesh is toooo fast and he is just right! He thinks that is why they nominated him to be the face of the company. We beg to differ! The “Goldilocks” line is cute but we know that everyone else does all the work around here and he takes all the credit. The Splash team is comprised of a colorful, bright, and driven group of individuals. They bring a host of different backgrounds, experiences and education which are a valuable repository of knowledge that our customers can tap. A business is only as good as the team that stands behind it. We are fortunate to have a great group of people on our team who are conscientious, driven and smart. A national mid-web Flexographic label printing company was experiencing challenges in producing nice minimum dot highlights and clean consistent color across the web. This is not uncommon in the Flexographic printing process. In this competitive market place, this customer wanted to expand into additional markets and targeted business that traditionally printed Offset. This exacerbated their current challenges. The first step was to run a test plate on the press in order to find out how they currently were printing. With that data, SGI was able to create a curve and suggest using the new plate technology provided by Kodak via their Flexcel NX Flexographic Printing Plate. This minimum dot reproduction capability of this customer has significantly increased (currently printing a 1% highlight dot). The color consistency across the plate has exceeded their expectations. In addition, there have been some significant benefits realized due to the dot structure and Square Spot technology provided with these plates. Color make ready has been reduced by nearly half. In one case, a wine label project that took 2500 feet of “make ready” substrate with the prior printing plate technology to reach “not-so-pleasing color”, took only 200 feet with the Kodak Flexcel NX Flexographic Printing Plate. Also the run lengths have exponentially increased due to the flat-top dot and the plate running cooler. In another instance, 1.1 millions impressions (nearly 700 linear feet of substrate) have been produced on one set of plates. This set of plates has been filed and is waiting the next re-run of this product. A national prestigious packaging printer who did not have a Chicago presence was experiencing serious communications lapses as a result of being 800 miles away and in a different time zone from their customer. Proof delays, delays in color edits and approvals as well as last minute alts were some of the more tangible problems. Additionally, their in-house graphics team was having trouble keeping up with the higher volume of work that their client’s required. Our team analyzed the various issues. We worked with the consumer product company and took control of the premedia work flow. In an effort to minimize time delays, we also put color managed proofers on both the printer and Consumer Product Company’s floor which were color managed by Splash. The results were miraculous. Splash worked thru the log jam which eventually turned into a steady timely stream of new work flowing thru production channels. The proofer on the printer’s floor helped them plan layouts, adjust them as needed and give us feedback early in the process. The proofer on the customer floor helped us to bring the brand manager color in a timely manner. No additional overhead was necessary. With a minimum investment we were able to bridle a fairly complex stream of work. This allowed the printer to focus on production and bring the client a timely product to the market. There was a 65% increase in turnaround time from what was being experienced prior to Splash’s involvement. A mid size cosmetic company was struggling with complex graphics that required various print solutions. Flexo, Offset, Digital etc. The nature of the brand required attractive eye-catching shelf presence. This required knowledge of various production processes that the in-house marketing and design team did not have. We were asked to help in procurement and file prep for the various processes that were being used. As a plate service provider in offset and flexo, as well as strong premedia capabilities our staff was very familiar with the different file prep necessary for flexo vs. offset vs. digital. In addition to this premedia work we have also taken on a role of procurement for this customer. The customer is very pleased with our proactive style of getting involved and managing the above processes. Recently we were asked to take on inventory management for this client.